Summary: Success at school contributes greatly to success in life. Unfortunately, learning disorders (aka learning disabilities) are a common contributor to poor school outcome. Fortunately, early identification and appropriate management of a learning disability can make a difference in eventual outcome. Primary care providers can play a key role with early identification of possible learning disorders, ruling out medical causes, and can recommend further assessment. With children and youth that have an established diagnosis of learning disorders, family physicians play a key role with case management and coordinating services. David is a 10-yo who lives with his father. He is normally a happy, outgoing child who likes to play outdoors, and enjoys drawing. He attends Gr. 5, but has never liked school -- "its boring and I hate reading." Father states, “he’s just like me – I never did well at school either… It only got better after I went into a trade... Now I even have my own business..."
Mathematics (e.g., computation, problem solving). Healthcare professionals might consider using the term “learning disabilities” in order to be consistent with schools. 3-4% of Canadian children have a learning disability (Learning Disorders Association of Ontario (LDAO); Statistics Canada, 2007). Does the student have unexpected underachievement in some areas (e.g., math, reading, writing), but has at least average ability in most other areas? Does the student have to work unusually harder than others in order to have the same marks as others? Does the child have a diagnosis of ADHD, and despite adequate treatment for ADHD, continues to have troubles learning? Younger children in primary school may have problems with reading, writing and math, and thus, such problems may present earlier. As kids get older (such as Gr. 5), they are expected to be able to do more tasks on their own and manage their own time (i.e., an increase in independence). What is difficult about your child’s learning? Distractibility: Any problems being easily distracted? Attention: Any problems paying attention? Hyperactivity: Any problems sitting still? Impulsivity: Does your child tend to act before thinking through the consequences? What sort of marks do you usually get? Any troubles with the teachers or the homework? Reading disorder: Any problems with reading? Do you like reading? Any problems understanding what you have read? Writing problems: Any problems with your printing or handwriting? Are you able to copy down what the teacher writes down on the board fast enough? Can you write down and express your thoughts? Sequencing: Do you have troubles getting things in the right order? Abstraction: Do you understand when people tell jokes? Do you lose or forget things? Memory: Any problems remembering things? Do you learn best by listening to people, or by reading? Learning disabilities are life long, however appropriate identification can lead to supports that can make a significant difference. There are many examples of exceptional individuals in society who have done well not only despite, but perhaps even because of their learning differences. not attributed to intellectual disabilities, developmental disorders, or neurological or motor disorders. Inaccurate or slow and effortful word reading (e.g., reads single words aloud incorrectly or slowly or hesitantly, frequently guesses words, has difficulty sounding out words). Difficulties with written expression (e.g., makes multiple grammatical or punctuation errors within sentences; employs poor paragraph organization; written expression of ideas lacks clarity). Difficulties mastering number sense, number facts, or calculation (e.g., has poor understanding of numbers, their magnitude, and relationships; counts on fingers to add single-digit numbers instead of recalling the math fact as peers do; gets lost in the midst of arithmetic computation and may switch procedures). Difficulties with mathematical reasoning (e.g., has severe difficulty applying mathematical concepts, facts, or procedures to solve quantitative problems). B. The affected academic skills are substantially and quantifiably below those expected for the individual’s chronological age, and cause significant interference with academic or occupational performance, or with activities of daily living, as confirmed by individually administered standardized achievement measures and comprehensive clinical assessment. For individuals age 17 years and older, a documented history of impairing learning difficulties may be substituted for standardized assessment. C. The learning difficulties begin during school-age years but may not become fully manifest until the demands for those affected academic skills exceed the individual’s limited capacities (e.g., as in timed tests, reading or writing lengthy complex reports for a tight deadline, excessively heavy academic loads). D. The learning difficulties are not better accounted for by intellectual disabilities, uncorrected visual or auditory acuity, other mental or neurological disorders, psychosocial adversity, lack of proficiency in the language of academic instruction, or inadequate educational instruction. Distractibility: Any problems getting easily distracted? Does the child have any problems with coordination? E.g., Is your child particularly clumsy? Any problems with gym class? Any problems learning to walk? Ride a bike? Are there any problems with feeling sad, depressed, angry, irritable? Any problems with feeling anxious? Are there any problems with vision? Hearing? Is the child advanced in any particular areas, such as academics at school? Individuals with learning disabilities are twice as likely to drop out of school, have more problems with employment, physical/emotional health, have higher levels of stress, and more problems with depression and anxiety. Any obvious deformities that might suggest a genetic syndrome? Any signs of low iron, nutritional deficiencies? Any sensory issues with the eyes or ears? Any cardiac issues that might be a contraindication to ADHD medication, if it were required? Any obvious coordination problems that might suggest developmental coordination disorder? Any neurocutaneous syndromes, dysmorphic features to suggest a developmental condition? There are no specific medical investigations for learning disability. However, are there any issues that might require referral? Children with learning disabilities are supported through the school board’s special education services. Formal psycho-educational assessments are typically not provided until age 10. If you suspect a learning problem, consider referring for a psychoeducational assessment to confirm that there is a specific learning disorder. Psychoeducational assessment through the schoolboard. Communicate with the child’s school that you recommend a psychoeducational assessment. The advantage of having your child assessed by a school board psychologist is that it will be funded through the school board. The disadvantage is that waitlists can be quite long depending on the school board. I am writing this letter on behalf of this student, who is having problems with learning. I would like to recommend that this child be considered for Psychoeducational Testing. Please do not hesitate to contact me if you have any further questions or concerns. For families with resources or access to insurance funding through their workplace, consider referring the patient for a private practice psychologist. I would like to refer___ for a Psychoeducational Assessment, which includes individual sessions for psychoeducational assessment as well as parent consultation. Language disabilities: Speech-language therapists work on language disabilities. Motor disabilities: Occupational therapists help with motor disabilities. Ideally, the school can provide SLP or OT support. In some cases, there is a shortage of SLP/OT support, and in those cases, it is recommended that parents seek out their own private practice services. E.g., students can be taught specific skills to help them deal with the learning disorder. E.g., a student who is a good visual learner will benefit from visual strategies such as pictures, drawings (as opposed to simply listening to a lesson). E.g., the student is taught how to identify when they are struggling and to be able to let others (such as teachers, parents) know that they need additional support. Written by Dr’s Peter Anderson (Psychologist, Children’s Hospital of Eastern Ontario) and Michael Cheng (Psychiatrist, CHEO), along with members of the eMentalHealth.ca Primary Care Team, which includes Dr’s Mireille St-Jean (family physician), Eric Wooltorton (family physician) and Farhad Motamedi (family physician). I am writing to give you an update regarding your student, who has a diagnosis of Attention Deficit Hyperactivity Disorder (ADHD) / Attention Deficit Disorder (ADD). Accommodations are essential for this student to function in the academic program. Specific accommodations will need to be devised for this student in collaboration with the youth and family. There are many ways that schools can help a child with ADHD succeed in the classroom. Meetings between parents and school staff, such as teachers, guidance counselors, or nurses, will allow for collaboration to develop helpful school structure for the child. The child may need particular changes (accommodations/modifications) within a classroom. Examples of some accommodations, modifications, and school strategies include the following options. Assign the child a seat that limits distractions. Sitting at the front of the class may be helpful. Reduce distracting sounds. Noisy classroom chairs can be quieted with tennis balls or padding at the end of the legs. Headphones may help a child’s concentration. Clarify the expectations for classroom behaviors. If children understand, ahead of time, what is expected of them and what the consequences are if expectations are not met, they will have a better chance at succeeding. Clearly draw attention to instructions that are given (for example, “Peter, this is a direction”). 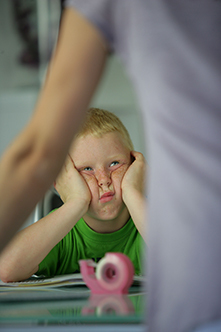 A child with ADHD often misses basic social cues. Ask the child to repeat instructions before carrying them out. Repetition reinforces the directions in the child’s mind and makes evident whether the child understood the instructions. Provide frequent check-in points during a lesson. Children with ADHD will respond well to supervision and encouragement that help keep them on track. Develop simple, discreet visual cues to help a child return to on-task behaviors. Children respond well to helpful reminders that do not embarrass them. Adjust to the child’s learning style. Untimed tests may be needed. For other tasks, a timer may help a child track the time needed to complete an assignment. Develop motivating strategies to complete assignments. By pairing easier tasks that a child prefers with more difficult tasks, a child will have more enthusiasm for all tasks. Help the child remember and retain important class materials. Write a list of needed class materials and develop a means for getting the list home (for example, tape it to a book or help the child place it in a backpack). Having a complete set of classroom materials at home and at school reduces time lost tracking down items such as pencils, erasers, paper, and textbooks. Taping important items such as pencils to the desk may reduce lost items. Identify appropriate times/places when the child can move (for example, ask the child to bring the attendance sheet to the office). Children with ADHD may need to move more frequently than other children. Provide an alternative, less distracting source of activity, such as a squeezeball or fabric to rub. Develop cues to help students stop talking out of turn. Nonverbal cues can be powerful and effective for all students. Identify when the child will be able to talk again. For students who blurt out answers, encourage them to write down answers before raising their hands to give answers. Before an activity, clarify expectations. Identifying the expected volume level and activity level before unstructured activities will help reinforce desired behaviors. Design interventions that interrupt the behaviors. For a child with trouble standing in line, assign the child to a specific place to stand in line, or a specific student to stand beside. For a child with difficulty with taking turns, develop a routine for waiting, such as counting to 5, and then raising a hand. Provide assistance with peer interactions. An adult’s help may be very beneficial for both the child and his or her peers. Encourage small group interactions to develop increased areas of competency. Children with ADHD may put forth better efforts in more contained groups. Encourage the child to help develop interventions. Enlisting the child in the task will lead to more successful strategies and will foster the child’s ability to problem-solve. Develop a behavior plan that is a true incentive to the student, as described above in Interventions at Home. Rewards may be given at school by a teacher or school counselor or at home by a parent. Teachers, school counselors, and parents can collaborate to use similar reward systems at school and home. Reward a child’s efforts. Every good effort deserves to be praised. Special thanks to Dr. Bostic and the School Psychiatry Program and the MADI Resource Center for permission to use this content. Francophone resource on eating disorders. LD OnLine is an educational service of public television station WETA in Washington, D.C., USA, and provides a comprehensive website with information about LD's, including multimedia/videos, as well as sections for Educators, Parents and Kids. Website with information including videos about learning disabilities. NLD on the website is devoted to providing information about Non-Verbal Learning Disorder (NVLD), also called Nonverbal Learning Disability. NVLD is a developmental disability where by individuals tend to be highly verbal, but with severe difficulties with non-verbal communication and skills. Bénédicte Blain, Ph. D., C.Psych. Mary-Jane Slingerland, E.C.E., B.Ed., MSc.Ed.